Paul Tamburello's got plenty of courage. Courage takes many different forms. For John F. Kennedy, courage was political. In his Pulitzer Prize-winning book, Profiles in Courage, the then-future president wrote about eight past U.S. Senators who had put the country’s interests in front of their own political advancement, or even survival. I particularly enjoyed the chapters about Daniel Webster speaking in favor of the Compromise of 1850, the third in a series of compromises that forestalled what eventually became our nation’s bloodiest conflict, and Edmund G. Ross, whose vote to acquit Andrew Johnson preserved the power of that office during a critical period in the nation’s history. Courage also means confronting one’s physical limitations and still sucking the marrow out of life. Fourth grade teacher, mentor and friend Paul Tamburello has been doing just that for the past 17 years. It was around this time in 1993 when Paul learned that he had Spinal Muscular Atrophy, a non-fatal variation of ALS, or “Lou Gehrig’s Disease.” As those in the ALS community well know, he turned what could have been a devastating experience into a positive one. 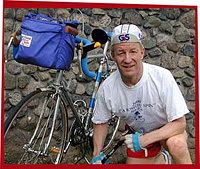 In 1995, in what has become an annual institution, he began the “Positive Spin for ALS” fundraising bike ride from Plymouth to Provincetown. I don’t remember the exact figure Paul raised during his decade of doing the ride by himself, but believe it was close to $300,00. About five years ago, he turned the ride over to the community, and it has changed in scale and grown in amount raised. Paul’s also battled physical adversity in his neck and knee, both of which have had major surgeries, and his attitude has always been to see what he needs to do to get himself back on his beloved dance floor, and then to do just that, even when the doing hurts a lot. Beyond his grappling with SMA and other aspects of physical challenge, Paul’s shown courage in his retirement, during which time, as his blog’s reader’s know, he has gone “At Large” to places at diverse as Chile to visit dear friends at their orange farm, to the Vendee Globe, a single-handed round-the-world yacht race that starts in France, and to New Orleans, which is rapidly becoming a third home for him, after the two he owns in Watertown and Westport. It’s not so much the distance or the places Paul has traveled, but rather his ability to be present in each of the places he visits, and then to transport us there with his words and images. I’ve long admired this man who has played a significant role in teaching me at what I used to identify as three distinct points in my life. After writing this piece, though, I’m realizing that the effort to break the lessons learned into distinct periods may have made sense at one point, but now are a continuous flow of gifts from Paul, one of the most courageous and generous people I’ve ever had the privilege to know. This entry was posted in Current Books and tagged Atticus Finch, courage, John F. Kennedy, Paul Tamburello, Profiles in Courage, PTAtLarge. Bookmark the permalink. Geez, Jeff, I’d like to smoke cigars and play poker with this great bunch of guys in whose company you just placed me. Satchel Paige famously said, “Don’t look back, something might be gaining on you.” So when you get diagnosed with a muscle disease, or you replace your worn out knee with a cobalt chromium model, or agree to some delicate surgery on your neck, you just figure out how to keep going. And where. Dive bars, dance halls, retro diners are excellent locales for therapy. Having an ongoing conversation with you since you were in my fourth grade class continuing right through high school, Stanford, your marriage, and your career as a journalist is one of the best gifts a teacher could possibly have. The two years between graduating from Stanford and beginning your own teaching career – years you spent working and teaching fourth grade with me – were the two most rewarding years of my career. Since then we’ve watched each other make transitions, had a ton of conversations about the craft of writing, and cheered the results. Thanks for this generous post. And yes, despite some health issues, I plan to be fully present in New Orleans twice in August – The Old Port Bar, Johnny’s Po Boys, Snug Harbor, Vaughn’s, The annual Satchmo Fest, The Rising Tide Conference, here I come. PS I raised a little over $300,000 from 1995 to 2004 with my Positive Spin for ALS and am grateful that the MA Chapter ALS Association has continued the annual bike ride that has now raised over one million dollars for research and its excellent caregiver and patient care programs.